You probably needn't be a five time world DJ championship winner and one of the youngest DMC champions in history to rock a dance party in 2012, but we'll be damned if it doesn't help. A-Trak, formerly Kanye West's DJ and currently a world-renowned performer on his own, tore down the Austin installment of vitaminwater uncapped last night. Though the party was held at a huge skating rink, no skates were distributed. Still, Dos Equis hooked up the open bar and there was much body moving, with A-Trak performing what could most accurately be described as audio surgery, stretching breaks and bridges, carving up records like he was vying for another title. Some songs were indistinguishable, but the ones that were, Kanye's "Mercy," French Montana's "Pop That" and The Rapture's "How Deep Is Your Love," sent attendees into a sing along frenzy. The community howling during "Big Bad Wolf," the single A-Trak released with Armand Van Helden as Duck Sauce, was particularly primal. Before A-Trak took the stage, fans were treated to the retro synth funk of Little Dragon. Ever-energetic singer Yukimi Nagano taught a dance class of sorts while leading the group through most of the band's acclaimed album Ritual Union. The night's surprise moment also belonged to the group, who brought out Big Boi to perform "Mama Told Me," a never-before-heard collab from Big Boi's upcoming album Vicious Lies And Dangerous Rumors. Between sets, Party Supplies kept the crowd in sway, attendees sweating out the day's troubles for the duration of the show, replenishing fluids with sips from ice cold vitaminwaters. Little Dragon even joined in on the act, dancing onstage with Big Boi as he performed an encore of "Shutterbug" to soothe a crowd left ravenous by A-Trak's nimble hands. Check out the vitaminwater YouTube channel for exclusive videos from the show. 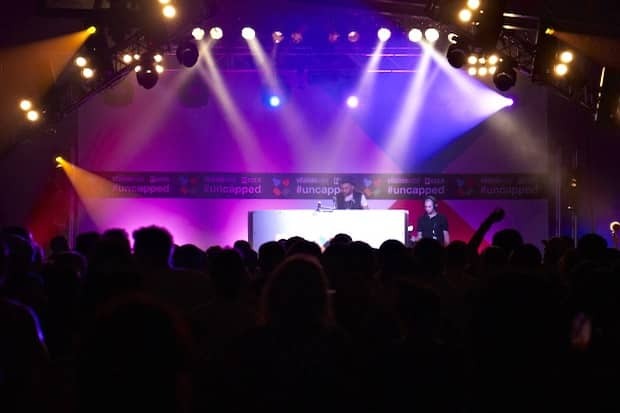 uncapped continues throughout the summer; see scheduled dates in the sidebar on this page and sign up for our mailing list to RSVP when we hit your town.